Cerealia Facula, also known as the brightest spot on Ceres, is shown in this stunning mosaic close-up view. The high-resolution image data was recorded by the Dawn spacecraft, in a looping orbit, from altitudes as low as 34 kilometers (21 miles) above the dwarf planet's surface. 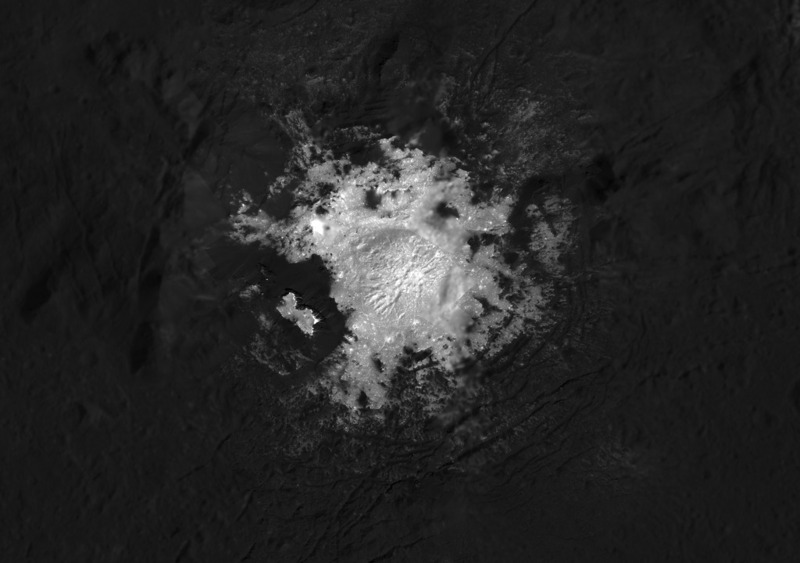 Cerealia Facula is about 15 kilometers wide, found in the center of 90 kilometer diameter Occator crater. Like the other bright spots (faculae) scattered around Ceres, Cerealia Facula is not ice, but an exposed salty residue with a reflectivity like dirty snow. The residue is thought to be mostly sodium carbonate and ammonium chloride from a slushy brine within or below the dwarf planet's crust. Driven by advanced ion propulsion on an 11-year mission, Dawn explored main-belt asteriod Vesta before traveling on to Ceres. But sometime between this August and October, the interplanetary spacecraft is expected to finally run out of fuel for its hydrazine thrusters, with the subsequent loss of control of its orientation, losing power and the ability to communicate with Earth. Meanwhile Dawn will continue to explore Ceres in unprecedented detail, and ultimately retire in its orbit around the small world.